I was thinking about constructing an area for self-taping at home, over a year ago now, but I got so engrossed in my master’s degree and finding ways of not having to work for anyone else, that it got put on a shelf under piles of research notes and essays. Since my course ended, I’ve had to spend my time searching for some work that, other than for monetary gain, I would not want to do. An amazing kick in the creative motivations. So, when I finally got a breather over the festive season, whilst all the normies were celebrating, I finally had time to get on with it. I was a little annoyed with myself for not setting it all up much sooner as it wasn’t as difficult as I thought it might be. It turned out that I had everything I needed for a basic setup already to hand. Smartphone to do the recording. The quality of phone cameras nowadays is more than sufficient. Tripod to hold my phone. I picked it up secondhand and cheap many years ago whilst I was doing a City & Guilds in Photography. (With real, film cameras – it was that long ago). It’s heavy but strong and stable. Tripod adaptor to hold the smart phone to the tripod. Roller-blind or sheet to use as a backdrop to record against. I had an old, broken roller blind. It was too heavy to hang from the wall initially, but with the roller mechanism removed, it was fine. Hooks. I found I had a couple of hooks that might hold the blind up in my tool box (but they would have been very easy and cheap to get hold of from any hardware store). I didn’t think they would be screw into the wall or be strong enough to hold or that the bottom pole would slot behind the hooks. It’s not perfect but it’s enough to hold it securely so that it doesn’t fall on my head. Light source – I think that lighting in my room might be okay. I did a self-tape using just he overhead lighting and it came out okay. However, I do have a couple of small lamps around the house if there are unwanted shadows in the way. I have a Lavalier clip-on microphone, I bought a few years back for recording video audio, that I was intending to use. But the camera is so close to me, I think the sound was perfectly adequate without it. I could have left everything set up in the corner of my room but 1) My cat is an ******** and he will probably try to climb up it, pull it down or scratch it the moment I walk out of the room. 2) I don’t want the corner of my bedroom looking as if it’s set up to record videos 24/7 and 3) Maybe I’ll get tempted to Vlog if I leave it up, and nobody wants that. The whole setup is pretty quick and easy to dismantle. I just have to lift the blind off the hooks, re-roll it and it rests nicely on the top of my curtain pole out of the way. All the other equipment folds away. I watched the video on How to Self-Tape at Home on Spotlight’s website. It contains pretty much all you need to know. But remember, you don’t need to spend a fortune on expensive high tech cameras. If you have a decent smart phone in your pocket, you already have the most important thing you need. So, what’s stopping you? Go tape your face! I hope that you find it easy to do and that you can now get videos out to casting agents. Happy new year and I hope that you all find your dream acting roles in 2019. I never thought that I would ever use the words ‘I am sad to be letting go of Margaret Thatcher’. Our run of Moria Buffini’s ‘Handbagged’ at Sewell Barn Theatre is complete. We are already history. Our wigs and costumes have been packed away and we have swept and painted the stage back to black. I still can not believe that I managed to get all of my lines into my head in time. I got the email asking if I could step in and take on ‘Mags’ on the afternoon of 3rd September, I was on stage for rehearsals that very evening and we started the show on 11th October. Just five and a half weeks to rehearse in the evenings and get all my lines into my head. I still don’t know how I managed it. I definitely couldn’t have made it without the help of my fellow Thatcher actor, Mrs T, Alexandra Evans who gave up hours of her time to run lines with me. She is an absolute star! There is still a little niggley (Un-Thatcher like) squirrel of doubt inside my head that keeps saying, if only I’d had more time, I could’ve, should’ve, would’ve… done it better. But I need to shoo that squirrel away and focus on the achievement. It was the longest I have ever been on stage. The most lines I have ever had to learn, in the shortest period of time. I have never played such a hugely iconic, historical, political figure. Whilst politically it would have horrified me to be compared to her, after getting to know her a little over the past weeks, I was quite taken aback at the entrepreneurial and libertarian similarities I began to see that we shared. It was good to walk in her heels for a short while and yet good to kick them off at the end. Below are some of the lovely things that people had to say about the show. I will pop the photos from the production onto to my portfolio when the photographer has finished working his magic on them. 🕒 1 minute readA quick update because I have been busier than a busy thing. 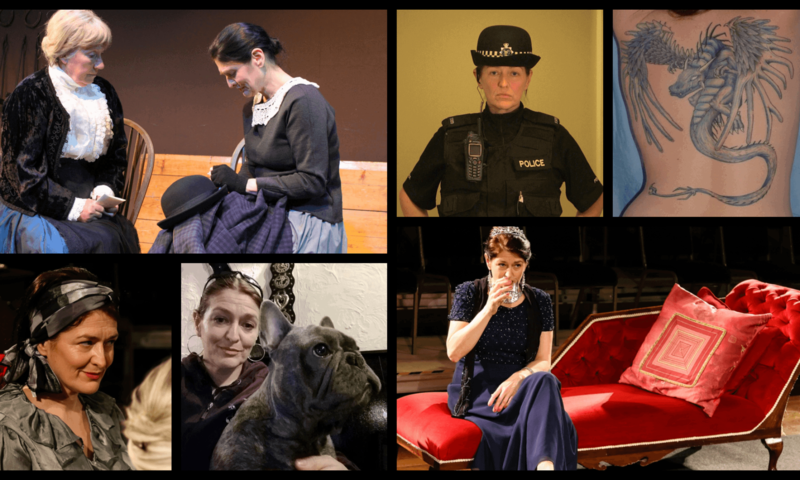 I’ve been looking for work after completing my master’s, doing interviews , Simulated Patient/Roleplay training as well as rehearsals for Handbagged. We only have a few days of dress rehearsals and tech to go. Then we begin performances of ‘Handbagged’ from 11th October. I stepped in for someone who had to pull out, so it’s been an intense few weeks. I’ve had to very quickly learn the play on the fly. It’s been much more challenging than having most of the lines in my head prior to rehearsals. I have got there, by the skin of my teeth, thanks to the lovely Alexandra who helped me run lines. Cassie, the Artistic Director for Sewell Barn Theatre came along and caught our rehearsal yesterday evening and had some lovely things to say on Facebook about the production. The photographs below were from our rehearsal three weeks ago and were posted to Sewell Barn Theatre’s Facebook page.